Investigators probing the disappearance of University of Iowa student Mollie Tibbetts were keeping details of the mystifying case close to the vest Monday, refusing to elaborate on the condition of the house where she’d been staying, even amid new information suggesting the home was her last known location. Rick Rahn, a special agent in charge at the Iowa Division of Criminal Investigation, would not go into specifics as to whether or not officials found any signs of forced entry at the Brooklyn, Iowa, home she’d been staying at on the date she vanished, or if investigators found indications of an unknown person or persons on the property. Rahn, noting details about the home were part of the ongoing investigation, did say authorities were not aware of any link between Tibbetts’ disappearance and the ongoing search for a man in Pella — a city about an hour’s drive away – who was captured on surveillance video Friday morning taking pictures of high school-age female joggers. Tibbetts, a college sophomore, was last seen jogging on July 18. Ongoing searches for her, which have included properties such as a hog farm, have turned up short. Police have not announced any suspects in her disappearance. 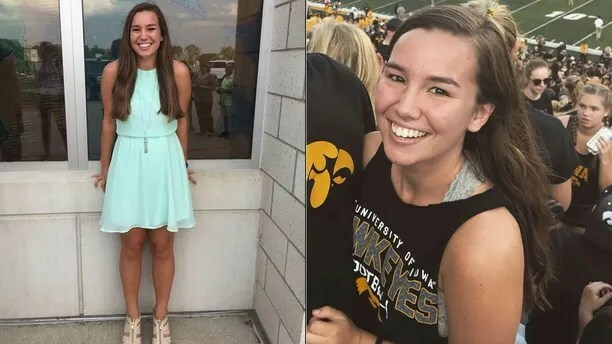 But the case appeared to take a twist over the weekend when KCCI reported her family members told the station evidence showed Tibbetts’ was doing homework on her computer late into the evening on July 18. That would suggest she returned to the house after her jog and didn’t disappear while running, as had been previously thought. The home is owned by her boyfriend, whom cops have formally excluded as a suspect. Tibbetts was staying there to watch his dogs as he worked a construction job in Dubuque, about 100 miles northeast. She was reported missing July 19 after she failed to show up for work. Tibbetts’ father, Rob, told Fox News’ Sandra Smith on “The Story” Monday night that anyone with information should contact the police tip line at 641-623-5679. Investigators are also looking into Molly Tibbetts’ Fitbit and social media data for any clues as to her whereabouts. The missing woman’s father said that while their family “feel[s] about the way you’d expect a family to feel” in this situation, their loved ones are “tough” and are “fighting” for Mollie. Authorities are offering a $1,000 reward for any information that would lead to an arrest or conviction in the case, Rahn said. The T.I.P. Rural Electric Cooperative is also offering their own $1,000 reward, according to the Des Moines Register. The Poweshiek County Sheriff’s Office, which is working the case alongside state investigators, the FBI and other law enforcement agencies, did not respond to a request for comment from Fox News. Surveillance footage broadcast by WHO-DT showed the driver parked Friday outside an auto body shop in what reportedly is a 2008 silver Honda Accord. After two women run by, the driver is seen raising an object outside the window of his car, then taking off. But he said police would like to talk to the driver to “to find out, number one, what he was doing exactly,” and see if that information leads to any signs of current or future criminal activity. Nicole Darrah contributed to this report.